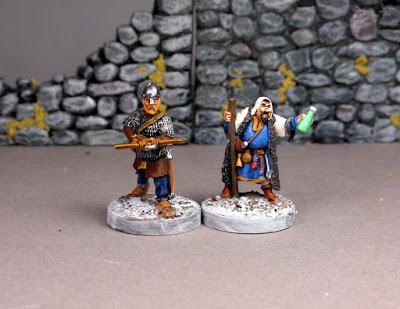 I love the adaptability of Frostgrave. 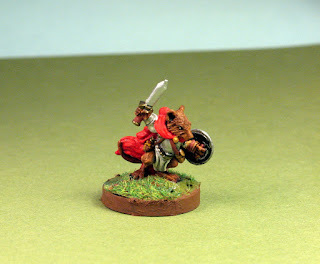 Like many of my favorite rules sets of late - SAGA, Lion Rampant and Dragon Rampant, nothing ties you into a specific figure manufacturer's line. 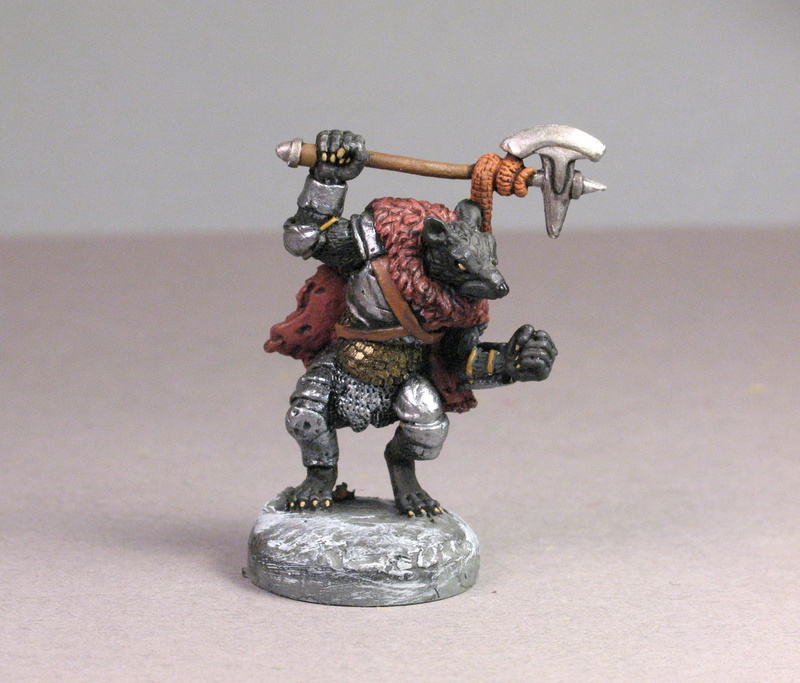 Of course, Northstar's dedicated line of Frostgrave plastics are excellent, but what about the metal characters? In all honesty, I wish they were a bit larger. 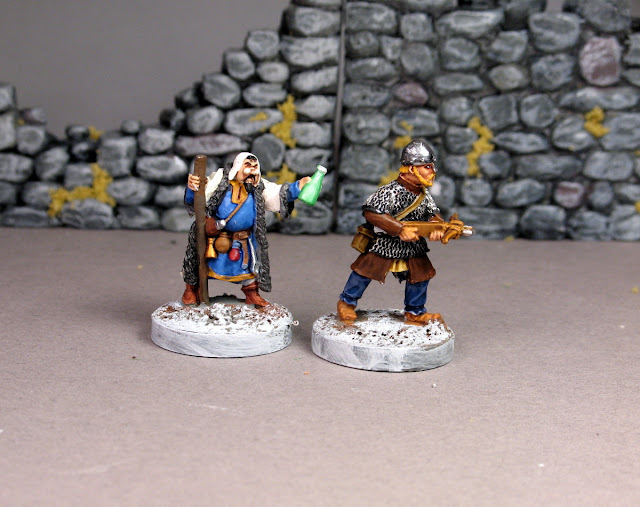 It is fine that the plastic sprues fit in with historicals, but I would like it if the metals stood out as bit more heroic. 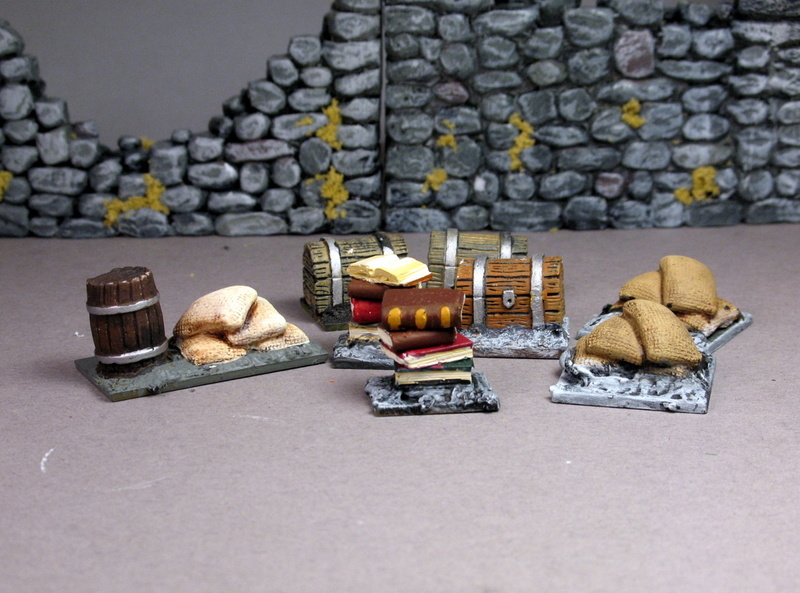 The potion master below is actually a bit smaller than the plastics. 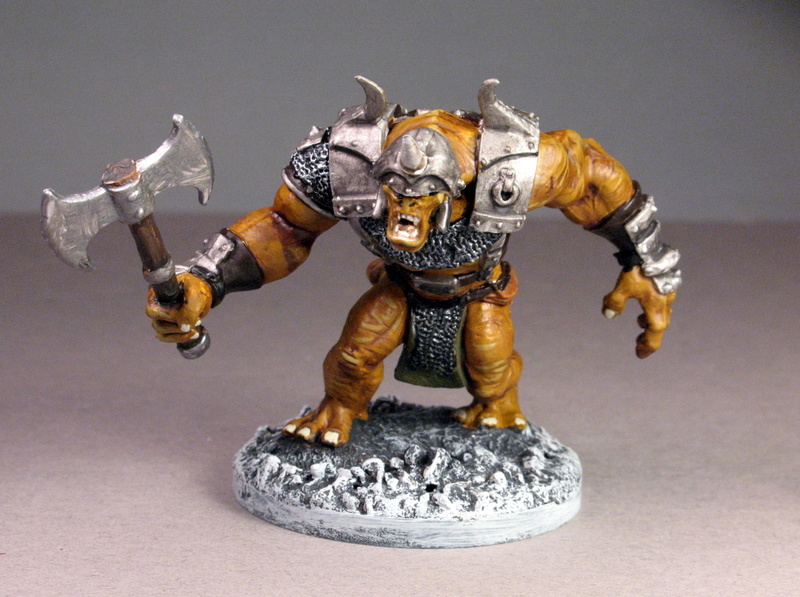 Which probably fits with the way it would work, but I like a little more heft out of my metal fantasy figs. I bought the pack pretty much for the potion master. He's a really unique character and tough to find a suitable stand in among my collection. The marksman is not terribly interesting - any Crusader Miniature crossbowman could stand-in for that roster slot. 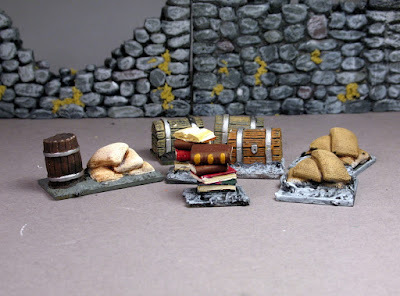 Here's some treasure markers I made up using Hirst Arts casts - barrels, treasure chests, a stack of books and some sacks. 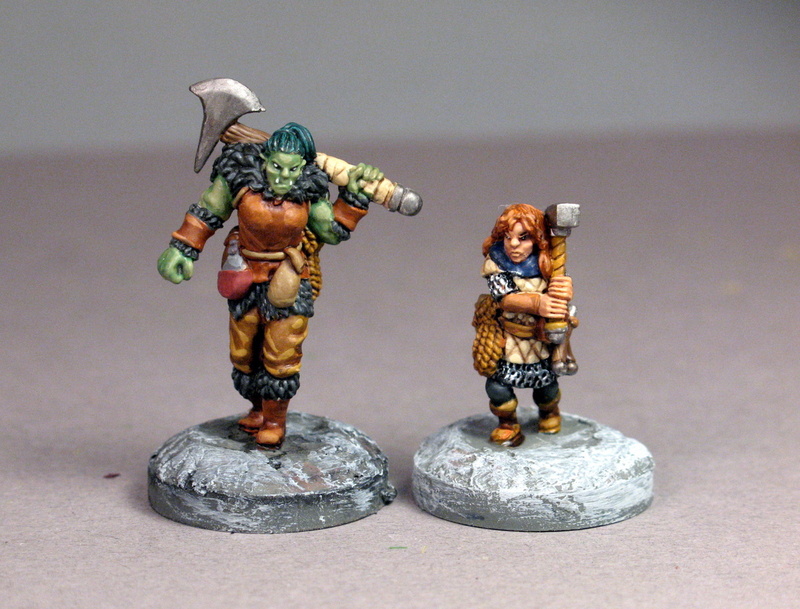 Finally, my last minis of the week are not Frostgrave related directly, but I suppose one could make them work. Both are Reapers, one is a half orc and the other is an ogre, although I painted them with the idea that the smaller guy is a half-ogre - a father/son pairing, perhaps. Increasingly of late, I have trouble painting to completion a kickstarter project from a company before their next line is announced. Maybe I will cut back on my kickstarters, but I certainly won't miss out on Oathsworn's next crowdfunder now that I have their most recent set painted. 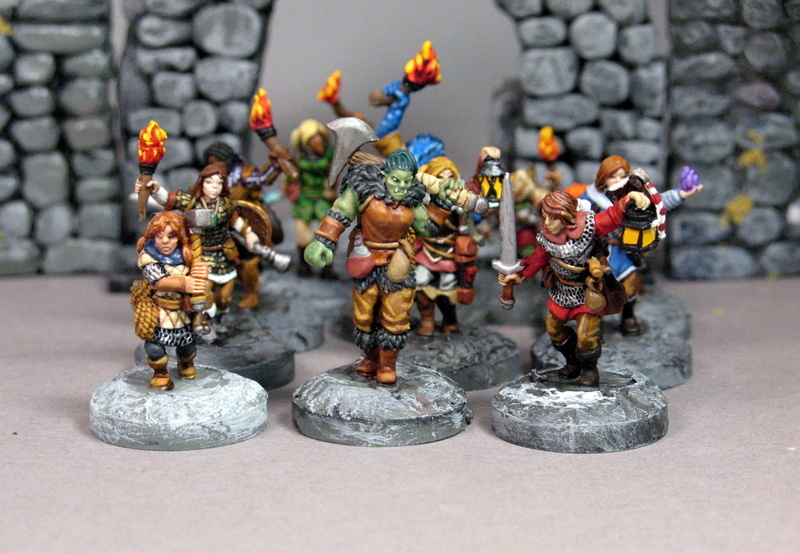 Earlier this year, Oathsworn offered a kickstarter of 11 female adventurers form the traditional D&D races and classes. 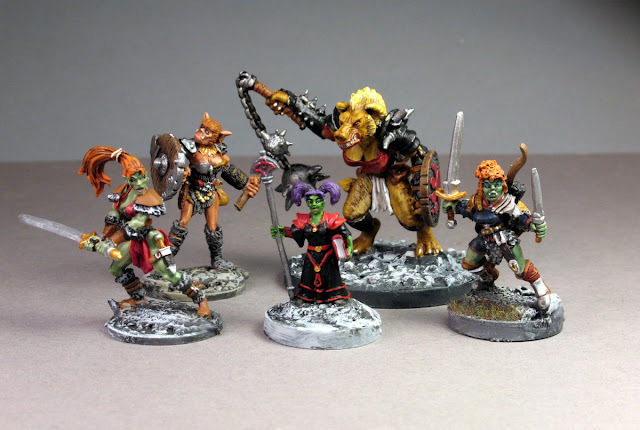 Their innovative concept for this range was a line of female adventurers in practical armor and gear rather than the more revealing and less functional outfits we have come to expect. 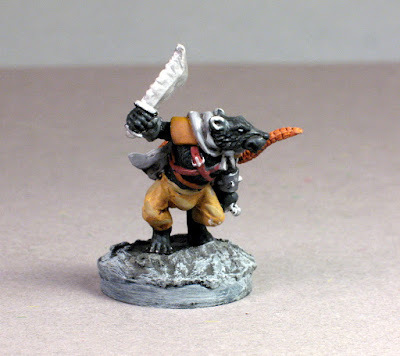 On one hand, I appreciate a good Werner Klocke female mini, but I might not want to put it on the table with my young daughter and son playing. 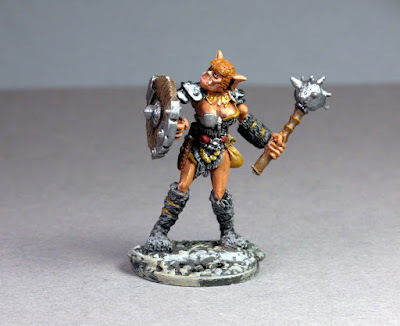 And since we are playing Frostgrave a great deal lately, chainmail bikinis are probably not optimal gear. As with their previous projects, the project was finished early and delivered a few weeks ago. A follow up project is promised soon. 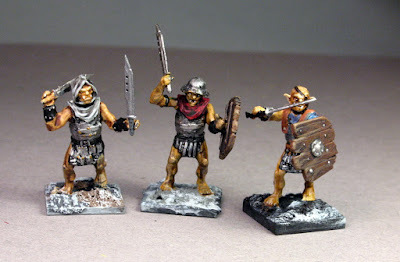 As far as size, they are heroic 28mm - slightly larger than historical figures or your old 80s Ral Partha, but closer to that size than modern figures that are pushing up to 32mm. The designs are clean and classic. These are adventurers on dungeon delve, not characters posing for a movie poster. 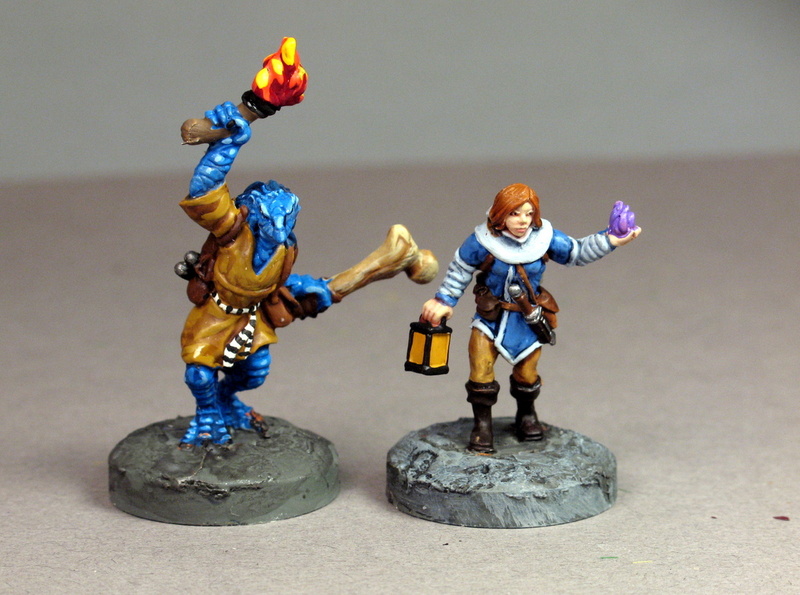 I question the overuse of lanterns and torches - don't halflings and elves have darkvision? But it gets the theme across. I probably should have taken the opportunity to learn object source lighting techniques, but I am generally of the opinion that it looks great when photographed and as part of a display but does not hold up as well right in front of you. That could be just the examples I have seen. 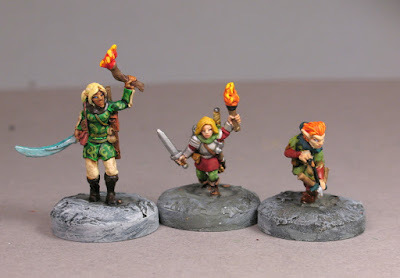 Overall, great minis and a great company. 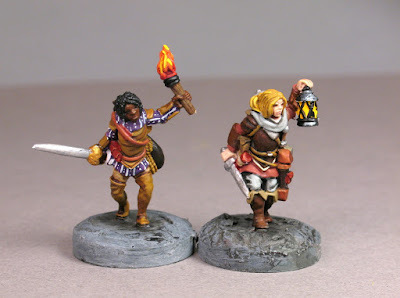 As I put the finishing touches on my Oathsworn Female Adventurers in Sensible Shoes, here are my final efforts from their Burrows and Badgers line. 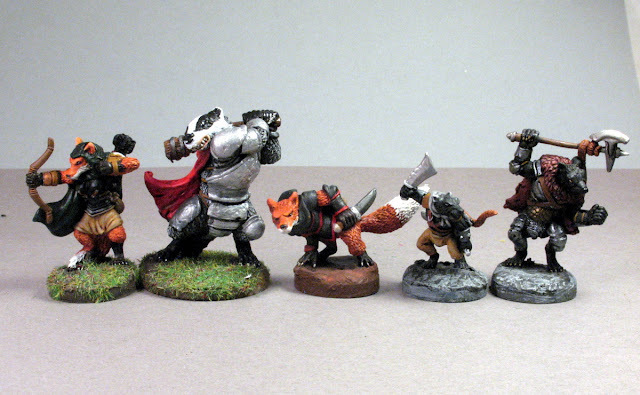 These are, for the most part, the larger figures in the line. 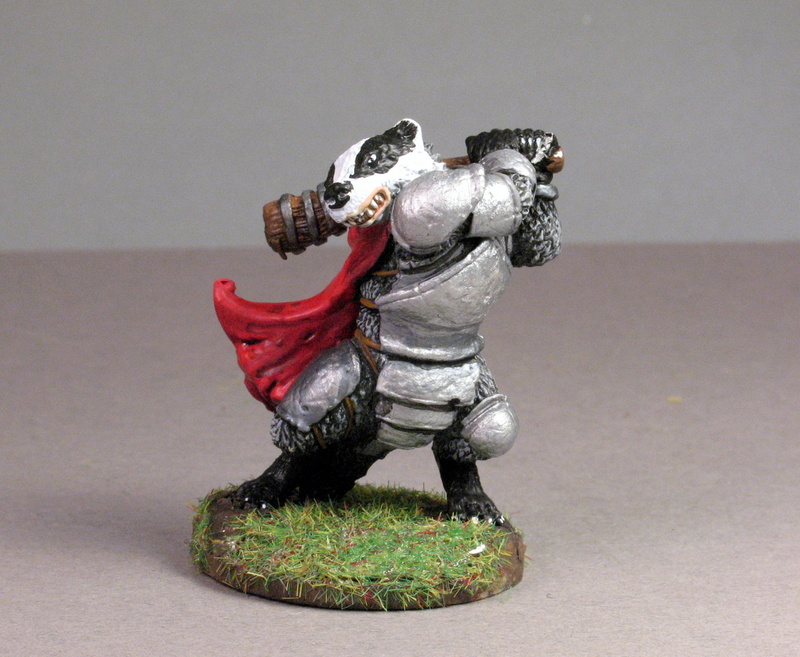 The titular badger is one heavy piece of pewter. 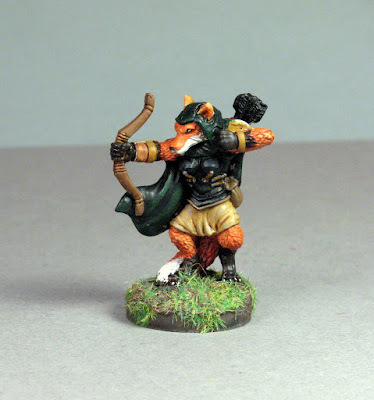 A female fox (vixen) archer. The fox thief was one of my favorite figures in the set. 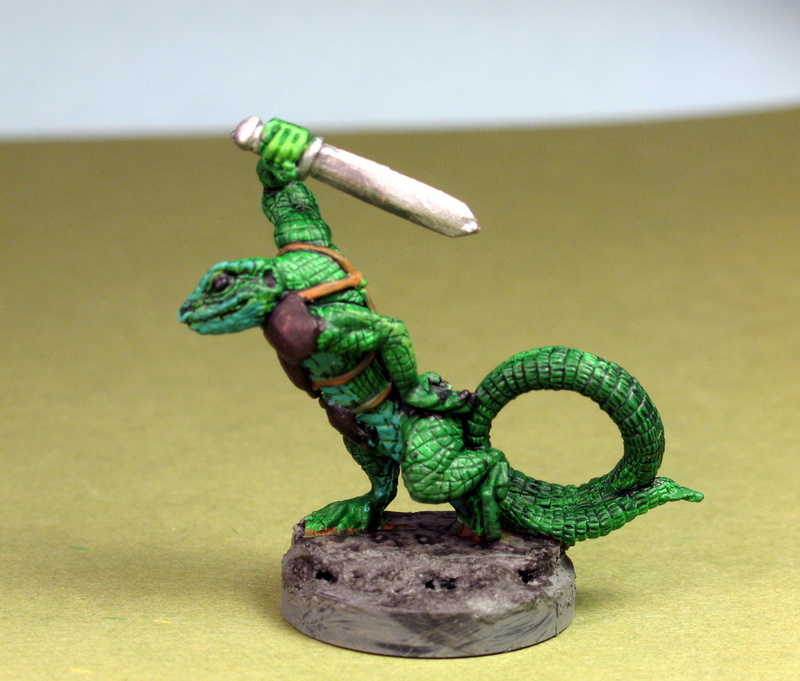 It has a great dynamic pose and a clean casting - a near perfect mini. As I said, these are some big figures. 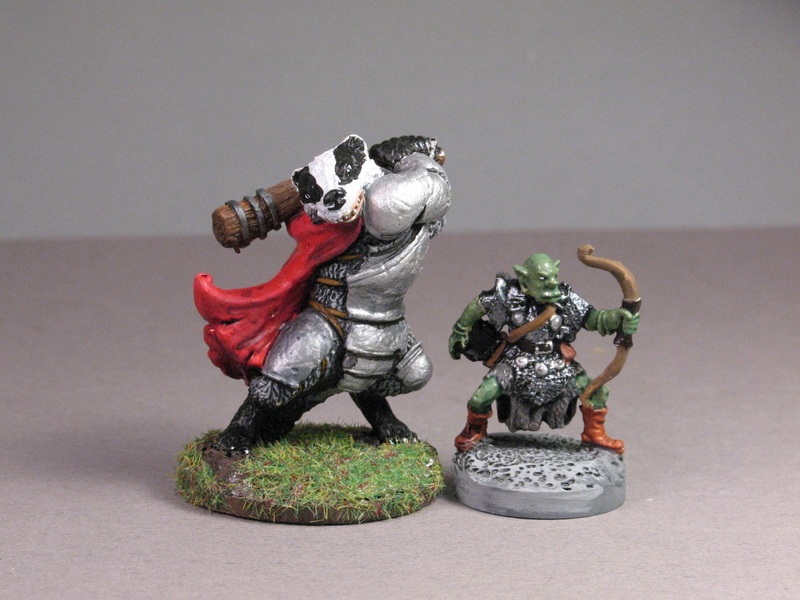 Here is the badger beside a 30/32mm Reaper orc. 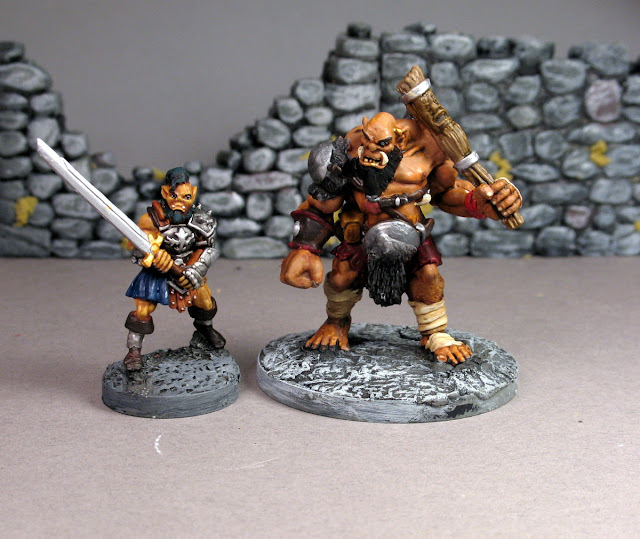 The size puts it easily in ogre/small giant size range. Below, a couple of black rat thugs or assassins. 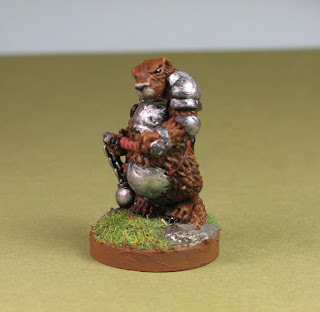 Oathsworn continues to be one of my favorite manufacturers. 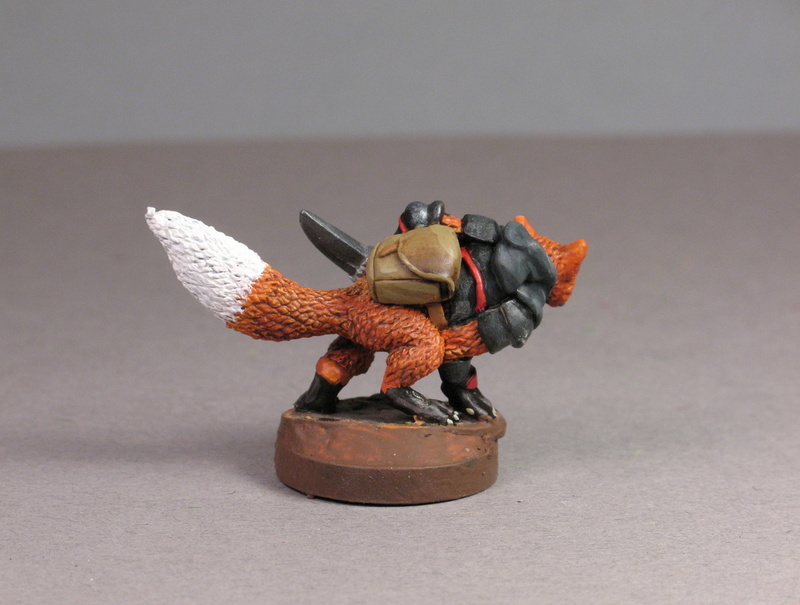 Its Kickstarters are always on time and well communicated. They have the perfect blend of innovation in concept and tradition in design. 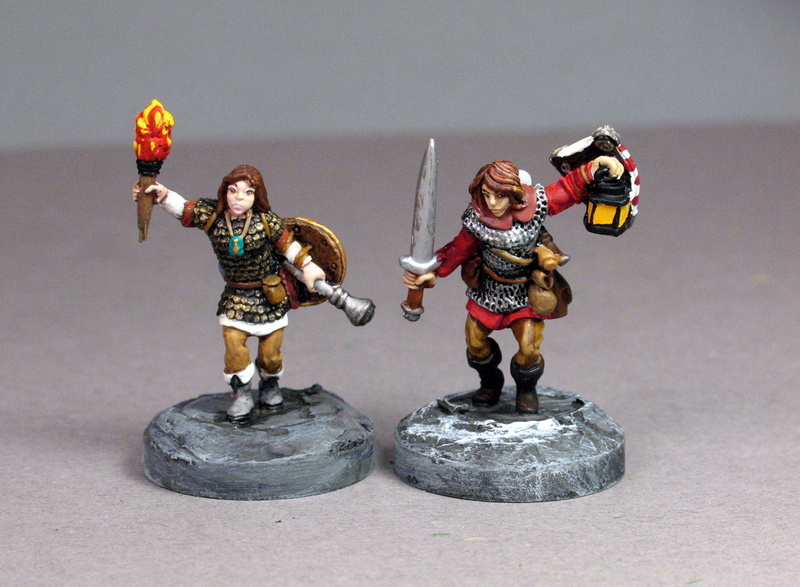 My next post should be their female adventurers in time for the next project from Oathsworn set to launch in a couple of days. This is one of the more interesting ideas for a Frostgrave warband I have put together, an all-female "monster" warband. I had started this before the Into the Breeding Pits expansion was announced, but I think they will work well with the new material. They might make a good Beastcrafter warband, as the author describes them as being a more animalistic type of magic, Read more at his website The Renaissance Troll. Looking for a goblin female was a bit difficult, so I went with a gnome female and gave her green skin. 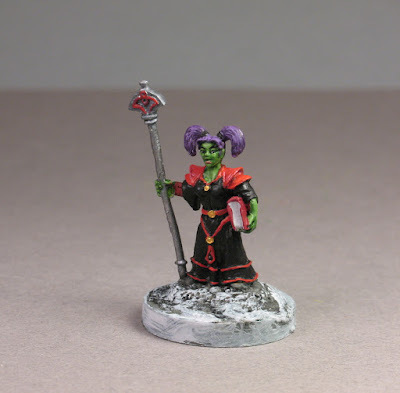 Not very d&d goblin, but maybe Warcraft. 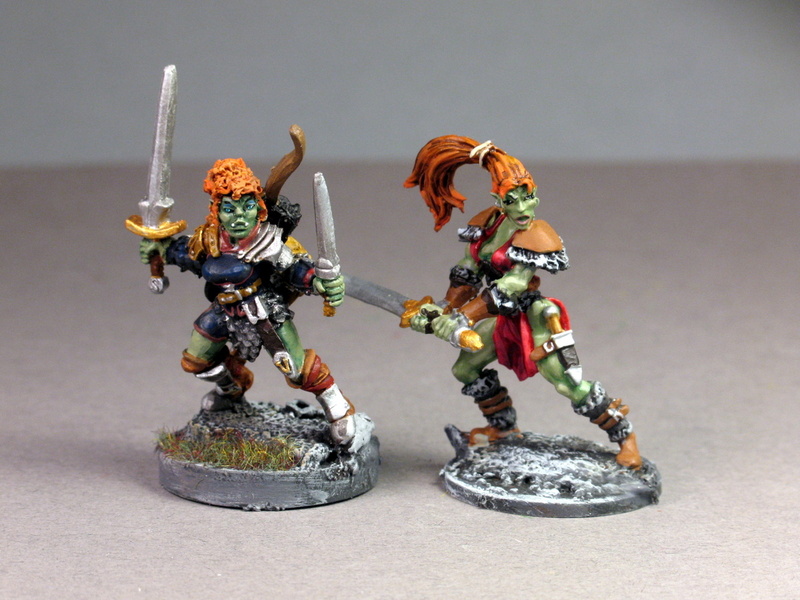 The two "sisters" shown below will be a ranger and a barbarian in the warband. A small party of female adventurers from Reaper, a warm-up for my soon to be posted Oathsworn female adventurers. The first on the right is in Bones plastic and the other two are metals. 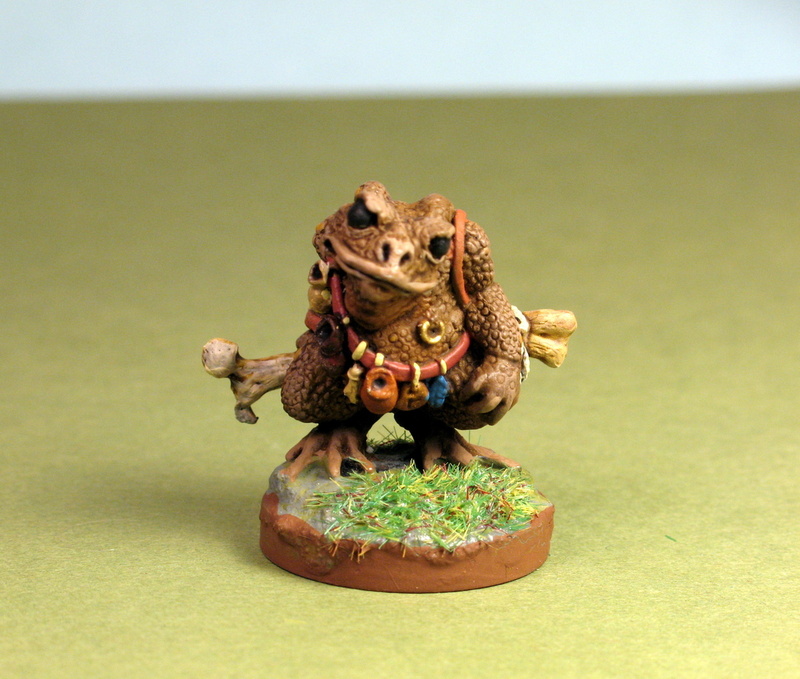 As it is from the first bones, it suffers a bit from a lack of details. It is also a bit tall for a figure that should be a halfing...or is it a dwarf? 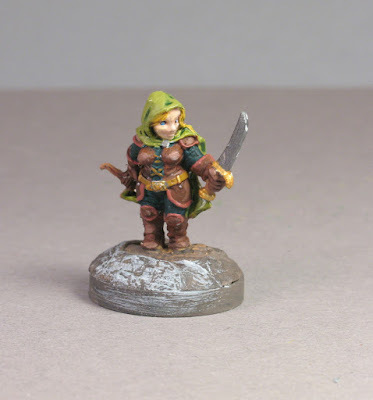 I have detailed my problem before with Reaper's "not small enough" halflings - but it is a nice figure. The dwarf above will probably end up as an NPC in a dwarven village, although I don't suppose there are too many dual wielding blacksmiths. Maybe it is a 3rd edition feat. 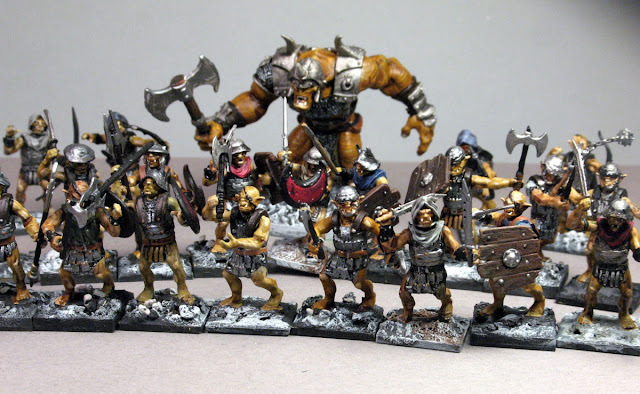 This week's project was finally getting a box of Wargames Factory Orcs painted and based. I must have bought them four or five years ago for a project I have since forgotten. However, with my new interest in Dragon Rampant, I decided to assemble and paint up the orcs. 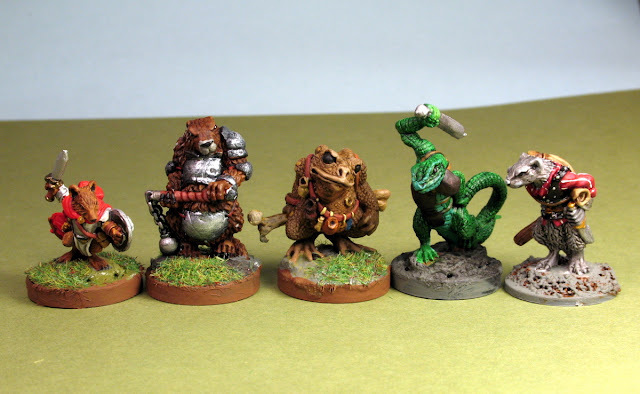 Some small group photos below. 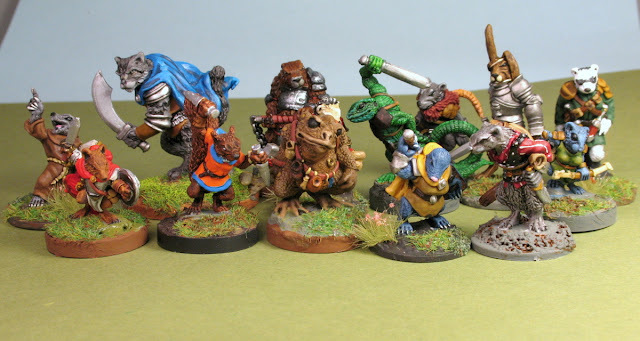 Overall, my impression of these figures is rather mixed. The look or aesthetic is well done. 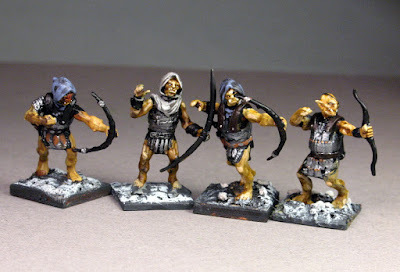 These are very much Peter Jackson LOTR orcs, not pig faced AD&D/GW orcs or noble savage Warcraft/Skyrim orcs. 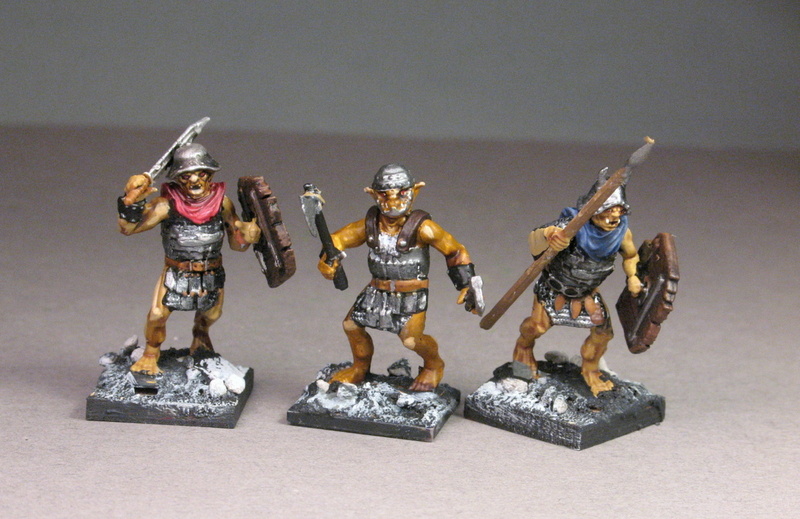 Their armor and gear is rather patchwork, suitable for the savage mob army from the films. In keeping with the films look, I went for an ocher skin color with a little goblin green and pale flesh mixed in. The design of the figures is something with which I had a bit more of a problem. The bodies and legs are separate pieces - which is generally a good thing as it gives more variation. However, the bodies are meant to be reversible, meaning either side is suitable for the chest to give even more variation. A nice idea in theory, however it does lead to some awkward poses and odd angles. The plastic material is a positive, though. Even on some of their bad figures, the hard plastic from Wargames Factory is durable, takes paint well and has minimal flash. 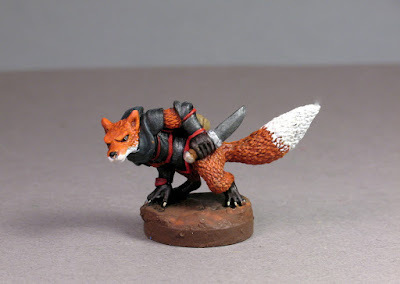 The weapons on the sprue are another positive. These are some real nasty looking weapons that orcs would make - serrated edges, extra spikes, thick little daggers and morningstars. As far as conversion and kit bashing potential, it's pretty easy. The photo above shows a spear bearing orc whose arm comes from a Gripping Beast Viking set. The orc archer on the far right has a recurve bow clipped on from the Gripping Beast Arab army. Some other bits come from the Frostgrave soldiers. A good Dragon Rampant army needs a big guy, so I threw in a Reaper Bones Mountain Troll. 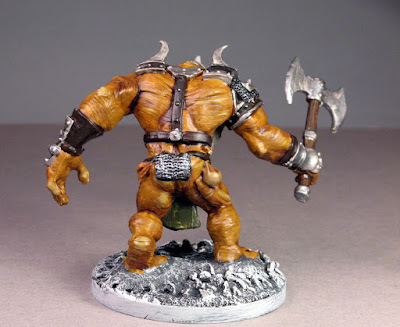 A great figure, and as I have said before, on figures of this size and larger, the bones material holds detail as well as metal. I have returned to blogging after a several month absence. All I can say is that it happens. Kids, job, exercise all come before the internet. 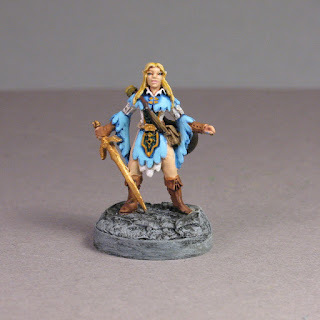 I haven't been so busy that I gave up on gaming and painting, but when the time crunch hit, taking pictures and posting was the first thing cut. I do have a nice backlog that should fuel some posts for the next couple of months. 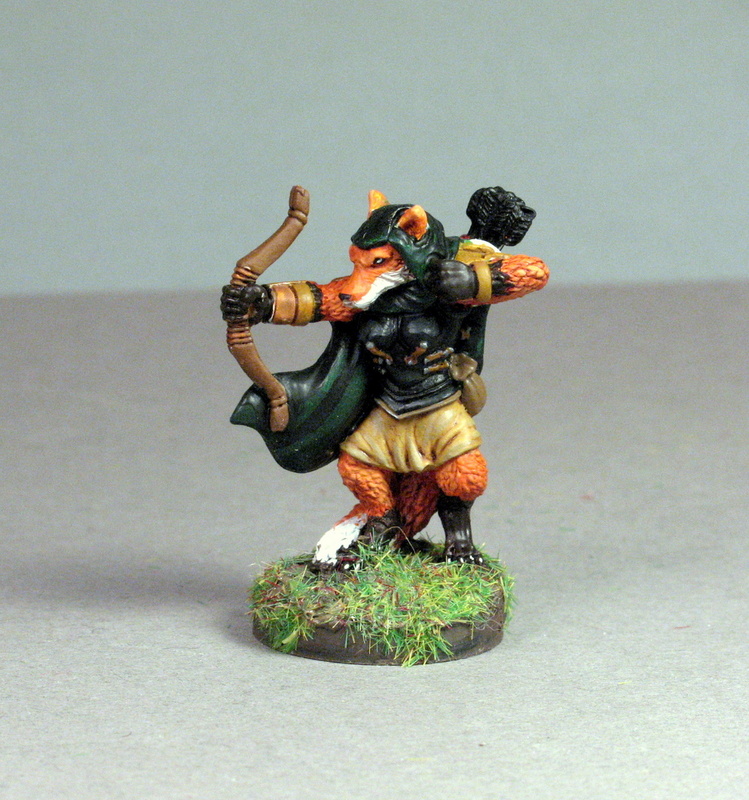 First up, more from Oathsworn Miniatures' Burrows and Badgers. This is from their first Kickstarter and I am closing in on finishing the set. These five shown below were most recently completed. 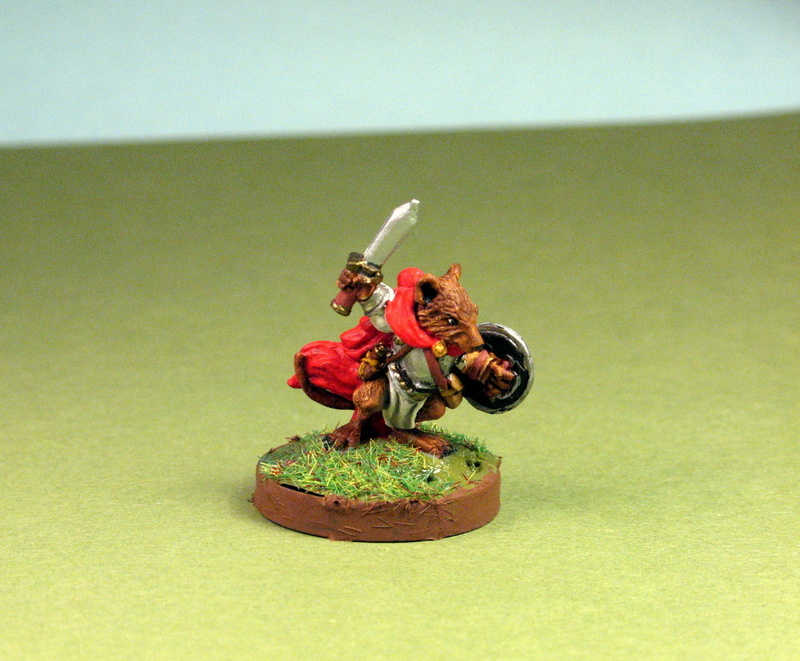 Nate the Wanderer, Mouse Hedge Knight. These figures are really begging for a D&D 5E conversion. 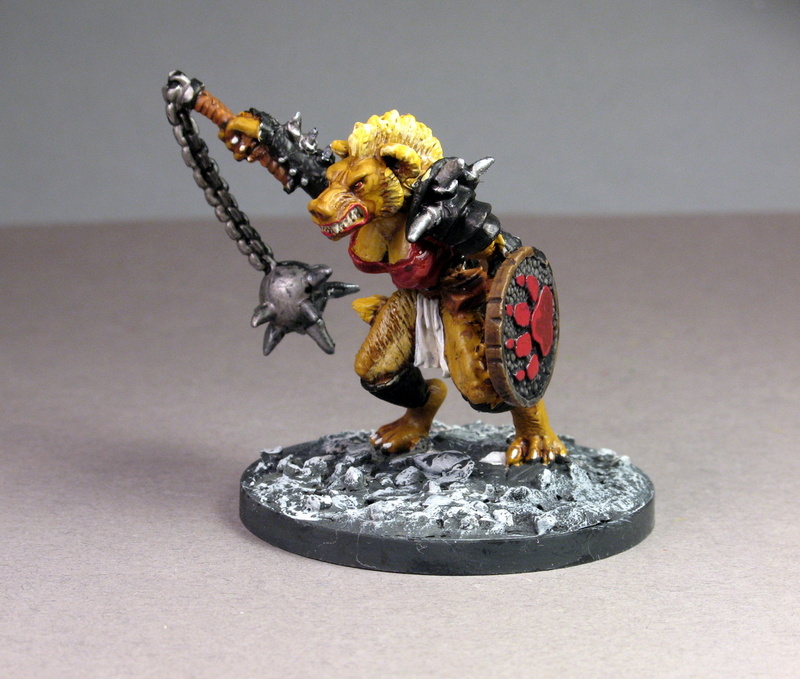 And I could put it on the DMS Guild...and that's how I take on too many projects with too little time. Maybe one day. 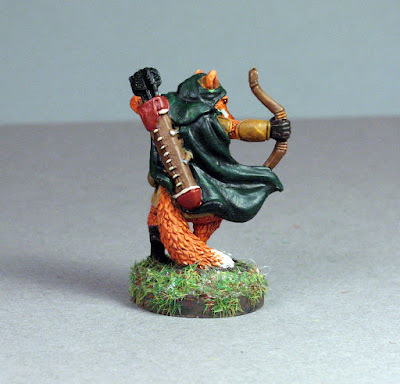 Oathsworn is one of my favorite manufacturers. Their kickstarters are almost always early and their figures show such a unique personality. They are not as detailed or elaborate as figures from larger manufacturers, but they more than make up for it in dynamics and characters. 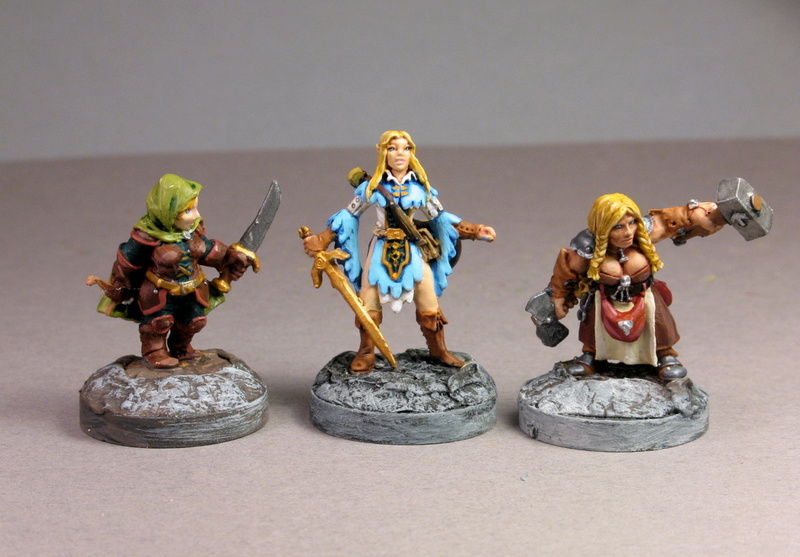 The castings are also top notch, quality metal and I am surprised to find the slightest bit of flash.